The Mighty Thor #706 Review – AiPT! This team has built a legacy for themselves and for a character who will be truly missed. Thor is dead. Jane Foster, dead. Mjolnir, destroyed. Asgard, in flames. The Mangog, sent into the heart of the sun. The gods of Asgard, saved by a mortal who stood in for a god when one was needed, was rejected by those in power, and defied every expectation. As in many things, however, this is not the end of the story. As effusive as I was about this last arc in The Mighty Thor, I had several people ask if I was upset by the events of this epilogue. Spoilers, but people come back to life in comics all the time. It usually is done attempting to literally resurrect part of the story or return a popular character to the pages. In The Mighty Thor #706, this certainly could have been the path taken. At the gates of Valhalla itself, reserved for those who died in battle and deserved their eternal reward, Jane Foster, resplendent in her raven hair flowing in death, could not cross the threshold. Odin himself came to lead her across, to apologize for his actions and to call her the hero she truly was. She could have stepped into the arms of the Valkyrie and gone on to her rest, but she felt unfinished, not as Thor, but as Jane Foster. She wanted to make the choice to return, but was denied the opportunity. Thor, acting impulsively as always, attempts to use the Mother Storm, the remnants of the power of Mjolnir to bring Jane back from the dead. If he had succeeded, I think the story of Jane Foster would have fallen into the same category as other comics resurrections. Instead, the Mother Storm is so powerful that it melts his metal arm and fails to bring Jane back — although it does shock her in the afterlife, surprising Odin, who returns to Thor’s side and makes a choice. The Allfather puts aside thousands of years of indifference towards humans and joins his son in bringing Jane back from the dead, allowing her to fulfill her destiny as Jane Foster, the woman who saved the gods. Perhaps most revealing in this issue is when Jane hands Odinson the only piece of Mjolnir she could find. The pebble of Uru metal is nothing in her hands, but weighs heavily on Odinson. Jane, even without the power of Thor, is still worthy, and perhaps always will be. She returns to a theme that has been circulating since the very first time she stepped up and took hold of Mjolnir: there must always be a Thor. In his glee at being reborn as Thor Odinson and the hopes that he can be worthy, Thor misses one last key moment in this saga. Jane chooses to give up her extraordinary life, heading back to Earth for treatment. Her story is not finished and she now chooses to fight in the way that she can, as Jane Foster. Her Thor died defeating the Mangog, but Jane and her legacy live on. 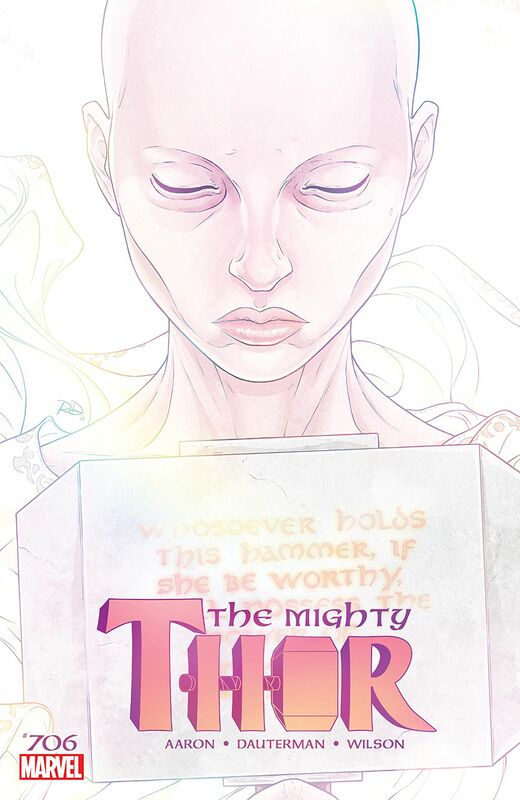 This is the final issue of The Mighty Thor for writer Jason Aaron and artist Russell Dauterman. In their farewell letters, both speak to the emotional impact that this series has had on them. Dauterman rightfully points out that their work would not have been what it was without colorist Matt Wilson. Together, this team has built a legacy for themselves and for a character who will be truly missed. The bar has been set and the gauntlet laid down. Aaron, Dauterman, and Wilson have truly created a masterpiece. Congratulations. Together, this team has built a legacy for themselves and for a character who will be truly missed. The bar has been set and the gauntlet laid down. Aaron, Dauterman, and Wilson have truly created a masterpiece. Congratulations. The Terrifics #3 Review: This book continues to be… Terrific!